NOTE: Weak springs can cause damage to your bands. 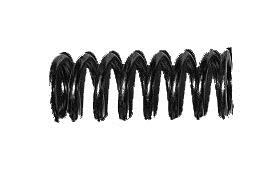 These springs are shorter than original and not recommended for use on cars that are driven much. These springs are for use with Scandanavia or Cotton Bands. Modern style bands such as Kevlar, wood, etc. require part # 3425BQ which is made to the original Ford drawings. Longer and stronger.